I had major issues with this company the 1st year. Their sales guy promised a lot and gave little., the company did not back up his promises even though they knew he made them. They fired him and keep my money. So you ask why am I still with company? The guy who fills my bate boxes each month is wonderful and as log as he's doing the job I'm happy. Estimator did a thorough job identifying termite locations. Justin did a great job very thorough. Justin is great! We are very happy he is assigned to our house. Thank you! Good job. I appreciate the follow through on my property. Excellent work as always for us, thank you for your great customer service and attention to detail. Thank you for always letting me know your coming. Workers are helpful, and polite. I have some questions please call me. Mark Cederquist 858-375-3910. Technician was thorough and professional. All Pest Pros is consistent in reminders of the services dates. I have access to the service reports through the portal. Also, I can communicate to the actual service technicians on the cell phone. I appreciate ease of communication! tech did a all pro job. Great service with great communication. My latest experience with PestPros has been great. I think it was a little rough in the beginning because I didn't understand the service I had purchased. The initial treatment appeared very thorough and I was given a detailed report along with suggestions for repair of termite damage. The tech I have had out the last two times has really provided good information and I feel like he has taken ownership of the termite control of my house. I would like to rate the service as much better than good but not quite excellent. 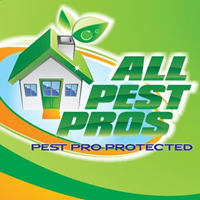 We continue to use Pest Pros because they are thorough and we know they have the integrity to do only what is necessary. We really appreciate their professionalism and the results are what we expect. Thank you. We would like to be on an annual inspection. He was courteous and he explained what the problem was. 👍. I like that I get pre and post notifications of coming, and everyone is very nice and curtious. Always on time, always professional, always polite... and best of all --- no bugs or rats! Can't say that was true before we started working with All Pest Pros four years ago. We are very satisfied. The service provider was very nice and professional. We are happy with our service. Service tech was prompt, nice and helpful. We're happy with your service. But we need you to come back and spray inside the house. We just had an annual inspection which was on time and there where no termites found or any damage to our house. Justin was great. He was prompt and professional. He was patient to explain all my questions and what was needed to get rid of my ant problem. After years of fighting ants in the house and around the yard, I just was sick of the ant baits and sprays. I am happy to say that there are no more ants inside my home and just a few in the yard areas. I am generally not a chemical kind of gal, but whatever you use really works. Ahhh. Keeping all the drivers away. Regular maintenance. Please spray fences & walls in yard for ants. The pest inspectors are always friendly and professional.